Reading a medieval book may not seem so different from reading a volume from your own bookshelf: just pick it up, flip to the first page, and start reading. However, apart from the fact that you cannot really hold the average medieval book in your hand – a single volume often weighs as much as a whole pile of today’s books – there is also a problem that occurs when you actually start to read. It turns out you need to decode quite a bit. The first round of decoding happens when your eyes meet the page. The letters on it are shaped very differently from what our brains usually process, so the CPU in our head starts to spin like mad, perhaps even encouraging us to give up. See what happens when you read this snippet from the famous Leiden Glossary (Fig. 1). When you’re done with that, try Thomas Aquinas’ autograph, written in what is appropriately called a ‘littera inintelligibilis’ – indecipherable script (Fig. 2). The paleographer Lowe defined the first of these as a Pre-caroline Allemannic minuscule, which means it dates from before the establishment of Caroline Minuscule, which came around shortly before c. 800. It is relatively easy to decode the latter with our modern brains. This is because early printers in Italy used Caroline as a model for the Roman typefaces, which ultimately became our Times New Roman. Because we read a version of Caroline on our computer screen every day, we can sort of make sense of a medieval page from the ninth century (Fig. 3). However, even when you are able to read such easy ‘typefaces’ from before the invention of printing, for example because you happen to be a medieval book historian, there is a second coding problem to overcome, which is much trickier: letters and words are frequently abbreviated with symbols. In fact, sometimes the text of a full page or even an entire book is written in code. Like any cypher, you can only read it if you know the key. Decoding abbreviated letters and short common words is not rocket science, nor will it have been for medieval readers. Some of these abbreviations are actually still in use today, like the ampersand in the first line of Fig. 3, which starts with ‘Ignibus & ignis’. The ampersand abbreviates the word et (and), from which it, in fact, evolved (more on the genesis here). Less frequent words could also be abbreviated, but this practice was tricky in that the medieval scribe had to judge whether the book’s reader would understand the abbreviations – otherwise the text could not be decoded. Students in the scholastic environment of the emerging universities were masters in coding and decoding words (Fig. 4). The students who filled this page with notes abbreviated the words like there was no tomorrow. In fact, in the top segment (in the lighter ink) every single word is shortened with the help of lines, half circles, loops, dots and whatnot. It makes sense that students did this: the remarks are for personal use only, so you could do what you wanted. Moreover, shortening text in this fashion saved time and space. Coded words created room for more coded words. In the Middle Ages a peculiar abbreviation language existed, which even an experienced reader at the time was not necessarily able to decipher: Tironian notes. This medieval system of shorthand made use of several thousand symbols, which abbreviated entire words. The language is rooted in Antiquity. The poet Plutarch tells us that Cicero had trained scribes to take down notes at a fast pace, including his servant Tiro – hence the name. In medieval times Tironian notes were used by scholars trained at the highest level (see this excellent blog post). During the ninth century, the heyday of the ‘coding’ symbols, scholars used them to add comments to a text or to criticise them, much like the students in the university textbook in Fig. 4, and for the same reason: to save space and to increase speed. 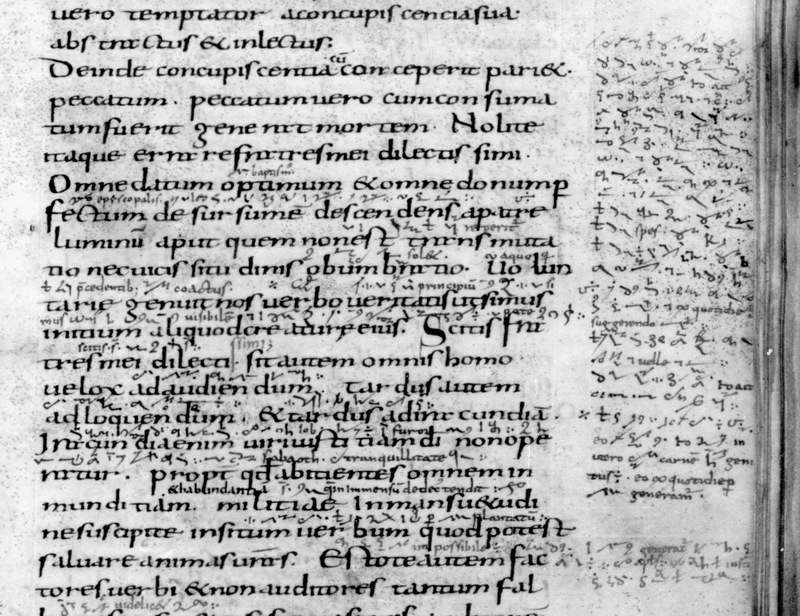 Sometimes such marginal additions are substantial, like those found in a ninth-century Bible kept in Paris (Fig. 5: right margin and in between lines). Very rarely does one encounter a full text or manuscript copied out in Tironian notes. The ones I know are all filled with the Psalms, such as Paris, Bibliothèque national de France, lat. MS 190 and lat. MS 13160, both from the ninth century (Fig. 6). 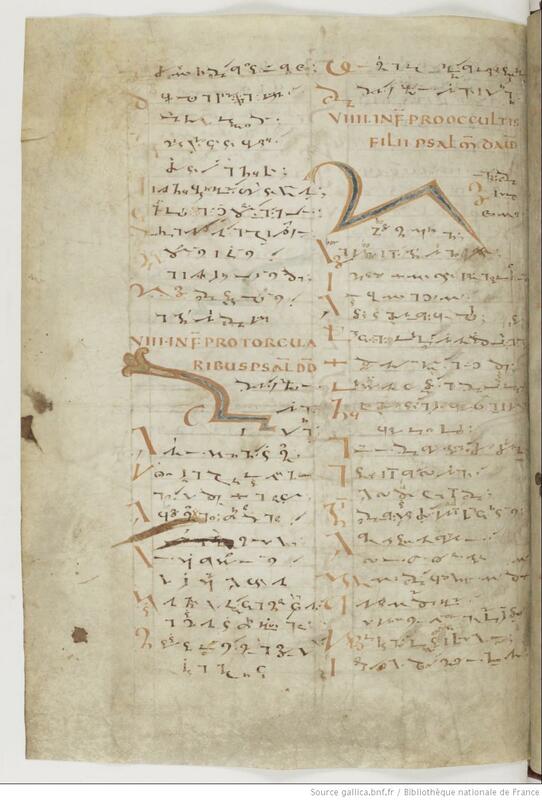 What is really great about these coded pages is that the first Tironian note of each chapter is executed in the same style as a regular decorated letter would be: enlarged and painted (see also the detail all the way at the top of this post). The result is a big and beautiful nonsensical shape – unless you know what it means. At first sight it seems an odd practice to write an entire book out in code, which could only be deciphered by scholars who had enjoyed the same high level of training as the scribe. However, perhaps these peculiar books were used to train individuals in the notation system? Monks knew the Psalms by heart, making them the perfect tool to learn the strange language of Tiro. The Latin titles would prompt a memorised text, after which perhaps the symbols would fall into place. It is striking, in this light, that the Psalms in MS 190 are preceded by a kind of dictionary to look up the meaning of the symbols – as you would want to do when learning a new language. Several of these explanatory texts survive, including in other Paris manuscripts (such as lat. 7493, lat. 8777, lat. 8778 and lat. 8780). A similar explanatory text is found in Leiden (Fig. 7). 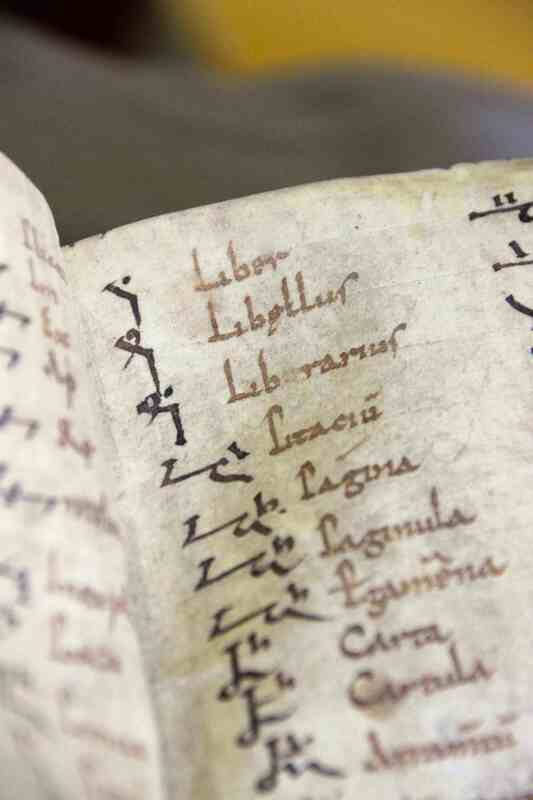 The first entries on this page read liber, libellus and librarius (book, booklet and librarian). The symbol for the first looks like a bent line with a dot, in the second the dot is replaced by a comma, while the third shows both dot and comma – a librarian, after all, looks after both books and booklets. Then follow related words, such as parchment (pergamena and, less common, pitacium), page and sheets (pagina, carta, cartula). As this segment shows, the text is not so much a dictionary as a collection of thematic word lists. While not everybody in medieval times would be able to read Tironian notes, probably many scholars could decipher it. However, there is a famous coded book that no one could read but its producer: the Voynich manuscript, which is written in an unknown alphabet (Fig. 8). There is considerable discussion about many aspects of this manuscript, including its precise date (see here) and the meaning of the text it holds. The latter is perhaps the most striking aspect of the code in which the text is written: no one has been able to crack it. The manuscript has fascinated scholars for a long time. Until 2013, when news outlets claimed the book had a genuine message (see here), it was not even clear if there was meaning in the madness. Finally, in February 2014 an English professor decoded ten words through the proper names of plants (see here). As intriguing as the book is, from a book-historical point of view it is far less interesting than Tironian notes. After all, while the Voynich manuscript appears to be coded in a highly personal way, placing the book in a relatively isolated position, Tironian notes provide an in-depth look into the fascinating world of medieval scholars. To hear their voices, all you need to do is crack the code. I Love medieval books and reading bout the lifestyles. I would have so much fun trying to decode this!! Medieval books are amazing, even though I sadly haven’t read one. Excellent post! Medieval writing is certainly a fascinating subject, and does require more “code-breaking” skills than one would think at first. I would like to mention two things– first, I believe that (even if there is some scholarly debate on the matter) the title of manuscript in the latetr part of your article is most commonly referred to as the “Voynich”, as you’ll see if you click through to the Beinecke’s website. Second, if any readers in or visiting the mid-Atlantic would like to see this manuscript (and a whole lot of other interesting items on codes and ciphers from the Renaissance to the present), the excellent exhibit Decoding the Renaissance is on display at the Folger Shakespeare Library until February 26th. In lieu of my usual Philosopher Fridays post, this week I’m sharing medievalbooks.nl ‘s post on the tricky business of reading Medieval texts. Have a great weekend. There are lots online to read! Thanks so much for your comment. You are absolutely right about the proper name of that manuscript: it simply got stored under the incorrect name in my head. I corrected it. Lovely exhibit in the Folger. I love reading about old manuscripts—I’d like to see more Voynich manuscript.Love a mystery. Very, very nice. One minor question (the only kind of question I am capable of generating): is the “Thomas Aquinas’ autograph” thought to be in Thomas’s own hand or in that of someone taking dictation? It is assumed this is his own hand, but your question is excellent, given that we know he often dictated (to several scribes at the same time, even). Great post for so many reasons, not the least of which is that this is a great story engine for … some project some day. Also — that speed was apparently a big consideration. We think we have to move quickly now, but don’t consider that was a concern in the past. That would have been a great fit! Medieval manuscripts are so fascinating! I myself had the change to tackle some of them, when I followed a course in Old Irish Paleography. It was hard work, but so fulfilling once you figure out, what the texts actually says! (Hope you don’t mind that I shared your page on the facebookpage of my studyassociation). Amazing article. It gives me such a respect for people who study medieval books. I think I would be stuck simply looking at the illustrations – which is worthwhile in and of itself I suppose. 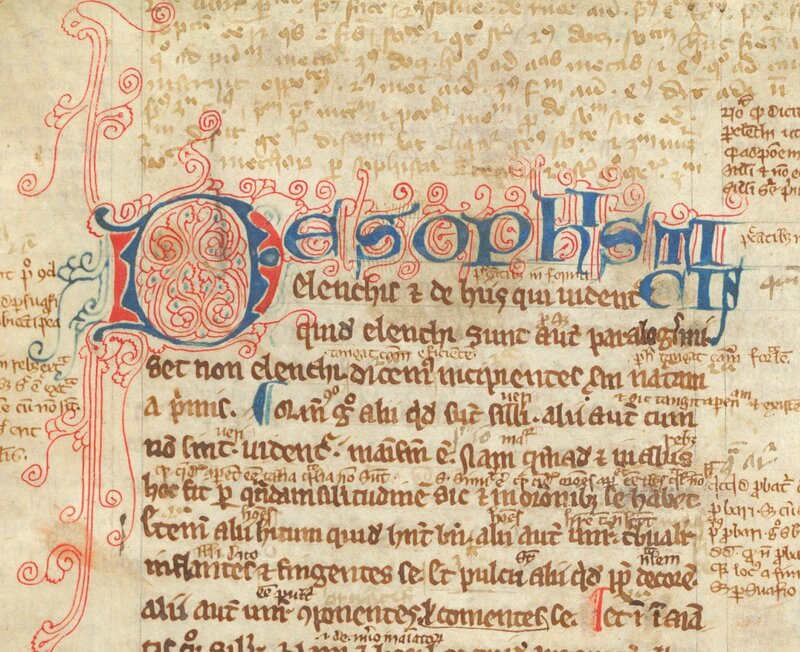 A wonderful in-dept article on Medieval books and the art and process of hand-lettering. It really gives you an insight into these treasures. Thanks for your comment – and for reading. Decoding ancient script is always a challenge. My father started doing genealogical research into both sides of his family through a local branch of the Mormon Library some 25 years ago. He encountered a number of Spanish-language documents that had been produced by various individuals, such as Roman Catholic clerics, dating back to the end of the 16th century. Much of the text was difficult to view, much less read. Yet, he’s managed to decipher literally hundreds of items; earning him the praise and envy of fellow researchers. But, his ability to read Spanish hasn’t been the key to his success. He developed a passion for the entire genealogical process, and that love sustains his curiosity. Mystery is what drives some scholars; the challenge of the existence of an ‘unreadable’ book. Others have come to the same view – myself and Don Hoffmann by different routes and I’m happy to say that one sees it more often repeated these days, if (unhappily) more often than the names of those who first said so.